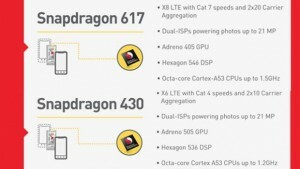 Just they presented the Qualcomm Snapdragon 617 and 430, two new high midrange chips including LTE modems and new multimedia features. 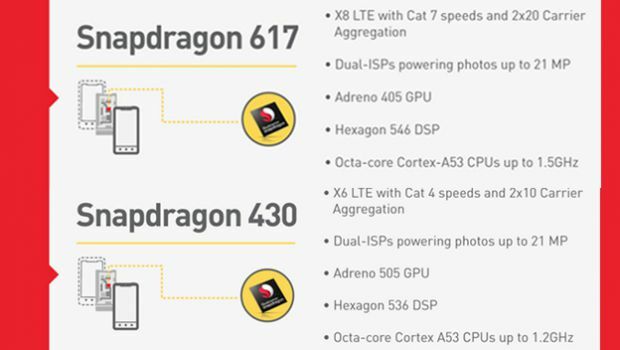 The Snapdragon 420 will be able to reach 150 Mbps downstream (Cat 4) and 75 Mbps upstream (Cat 5) with the X6 LTE. It is also capable of supporting cameras with sensors up to 21 megapixels. For graphics it includes an Adreno 505 GPU with support for Open GL ES3.1, Android Extension Pack and OpenCL 2.0. For its part, the Qualcomm Snapdragon 617 has a modem X8 LTE with which to download 300 Mbps and uploads of up to 100 Mbps. In addition, he will share some skills with the 620 and 618, and will feature dual processors of image signal capture photos up to 21 megapixels. These new chips feature a Qualcomm CPU ARM Cortex A53 eight-core 1.5GHz (617) and 1.3 GHz (420), in which the new Quick Charge 3.0, a technology that allows you to charge your device includes 80% in 35 minutes. The loading speed is 27% higher than in the 2.0 and to this end, uses a new technology called INOV (Intelligent Negotiation for Voltage Optimization), which is an algorithm that streamlines the load. Similarly, this technology makes it longer, protecting the life cycles of the same and better controlling the heating. 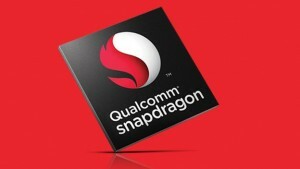 The Qualcomm Snapdragon 430 will begin shipping during the second quarter of 2016, while the 617 will arrive in late 2015.